Dr. Michael Goldberg with a patient. Dr. Michael J. Goldberg of Englewood can’t keep track of how many times he’s treated disadvantaged Jewish and Arab children through Dental Volunteers for Israel since 1984. Now vice president of American Friends of Dental Volunteers for Israel, Goldberg is chairman of the charitable organization’s 30th anniversary gala to take place at the Museum of Jewish Heritage in Manhattan on Nov. 28. DVI was founded by Holocaust survivor Trudi Birger in 1980. The Jerusalem clinic named in her memory provides comprehensive free dental care and education for kids ages 5 to 18 referred by the Jerusalem Department of Social Welfare, shelters, and non-profits. Though its support staff is permanent, the clinic depends upon donated expertise of licensed practitioners. More than 4,500 dentists from around the world have helped DVI provide about 15,000 treatments each year. 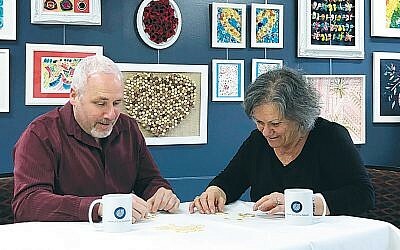 After Birger’s death in 2004, Goldberg was among a small dedicated group who began working with her widower, Zev, to fill the leadership vacuum and continue raising funds and recruiting volunteers. Though several Jewish North Jersey dentists have volunteered with DVI, Goldberg said most volunteers are non-Jews from Europe and North and South America. One dentist from Finland became so interested in Israeli culture thanks to her work at DVI that she began an Israeli dance troupe at home. She is scheduled to perform at the gala. Dr. Scott Dubowsky, a Tenafly resident who practices in Bayonne, said he’d like to see more dentists from the United States join in DVI’s work. 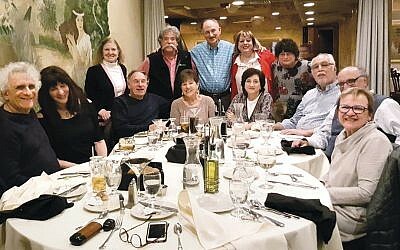 Dubowsky, who volunteered on the forensic dental team in Manhattan for nine months following 9/11, had been planning to go on a UJA Federation of Northern New Jersey mission to Israel three years ago when Goldberg suggested volunteering for DVI. “I went once and I was completely hooked,” he said. “I strongly identify with being Jewish and with Israel, and my lifelong profession is dentistry, so DVI gave me a chance to put all those things together for the first time.” His fourth trip is planned for March. Alayyan was referred to DVI by Jerusalem’s Welfare Department in 1984, when he was 7. Living in an Arab neighborhood of the Old City, he had been missing school because of severe dental problems. He returned every six months and was inspired to become a dentist himself. Alayyan practices in East Jerusalem and is part of DVI’s local team of dentists on call to fill in when foreign volunteers have to cancel at the last minute. In June 2009, Alayyan joined DVI’s staff in receiving the President’s Award for Volunteerism from President Shimon Peres. Dubowsky said indigent Israeli children – from haredi Jews to Palestinian Arabs – often suffer from advanced dental disease as a result of poor dental hygiene and a diet high in sweets and refined carbohydrates. 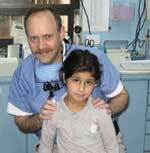 Dr. Scott Dubowsky of Tenafly stands with an Israeli patient. For information on the gala or on volunteering, call Betty Goldfond, program director, at (201) 336-0230 or e-mail afdvi.ny@gmail.com. The deadline for dinner reservations is Nov. 8.